Join us for an exclusive networking opportunity for CA Young Leaders on 14 Sept. The Young Leaders Summit will be held in the stunning Leadenhall Building, otherwise known as 'The Cheesegrater', in London. Enjoy exclusive networking opportunities and fascinating keynote speakers. Networking is a great way of meeting like-minded people in your field and can help you reach the next step in your career. Are you ready for an exclusive young leaders networking event? In the first event of its kind for ICAS, young CAs who are leading their profession are invited to an inspirational conference in the heart of the city on Thursday 14 September. 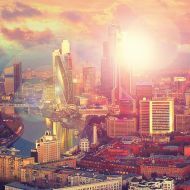 The Young Leaders Summit will be held in the stunning Leadenhall Building, otherwise known as 'The Cheesegrater', surrounded by breathtaking views of London's skyline from Landing Forty Two - the highest event space in the City. The day is filled with CA-led lightning sessions, exclusive networking opportunities, and fascinating keynote speakers, while the evening is dedicated to celebrating the future of ICAS. Here are some tips to help you make the most out of these valuable events. Contacts book: Although you will have a digital version of this in your phone, a physical book won't run out of memory or power. Business cards: Make sure they look as professional as you do. Take as much care choosing the design as you would picking out your outfit for the event. Winning smile: Keep your body language open and welcoming. No one wants to feel like they are boring the person they are talking to, and people generally avoid those who are hiding in the corner. A little bit of background information can go a long way. Have a look at the list of attendees for the event and make a note of who you think will be the most valuable connection to you. Google them and take a look at their social media pages. All ICAS events now list the CAs attending the event under the attendee list on the event page. This feature is exclusively available to ICAS members so make sure you login to icas.com first to see the list. You can even message the other CAs attending this event and arrange to meet them beforehand. When you do learn someone’s name, try and use it a couple of times during your conversation with them. The repetition will help the name stick in your head. If you suddenly realise that the name of the person you are talking to has fallen out of your head, don’t worry. Get over any embarrassment and just ask. “I’m sorry, but I’ve met so many people tonight I’ve forgotten your name,” and smile. Try to keep conversations short and sweet. Make an impression, exchange details, wish them a pleasant evening and move on. After exchanging details with someone, make a note of something interesting you may have learnt about them. You can bring it up the next time you speak and it will show you took a genuine interest in them. For example; Adam Smith is expecting his first child in May, or James Bond’s favourite drink is a vodka martini. Well, perhaps one to settle your nerves, but that's it. Yes, you want to be remembered, but not for the wrong reasons. Don’t let all of your hard work count for nothing. Reach out and maintain the connections you have made via LinkedIn. Get a calendar and jot down a daily list of people to call/email and tick them off as you go. Making sure you stay visible to your contacts is just as important as making the initial connection. Throughout the year ICAS regularly holds fantastic networking events, both in the UK and around the world. These events present a perfect opportunity for members and non-members to meet.